It’s a casual Friday night after Lunar New Year. The colorful sparks of firework mark the end of Lunar New Year, as well as the start of the annual parade. To Singapore, Chingay Parade is the second most valuable season. It is a nation-wide parade for Singapore to reassure its stable friendships with countries so as to bring one nation to one. Practically, it is quite hard to bring people from different ethnic grounds to one. Throughout the history of humankind, tribes and nations have been the source of inspiration and motivation for people. People felt the sense of belonging because they were part of one homogeneous community. Singapore is a rare yet successful case, where people found motivation from accepting difference. Chingay Parade is the evidence of that. The parade is like a bunch of flowers. If you expect to see only red because we call it ‘Chinese New Year’, you better not. Literally, every single color can be sighted especially when all of them are busy preparing for the parade. From the moment the participants start preparing the parade has begun. 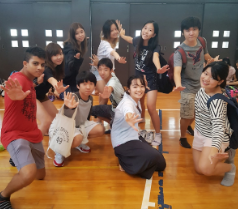 Different nationality teams enjoy their time taking photos together, talking to each other and strolling around. It may look like a chaos to hear all kinds of traditional songs and beats at the same time but as you watch it, you will notice that this is what people call Singaporean. The parade is fun. As you clap to the beat, cheer for the performers, take photos and cheer with other, you feel like you are really engaged in the parade. Also, it is perhaps the best attraction for tourists. Seeing fancy and casual tourist attractions are also fun, but Chingay Parade could be a good chance for them to see the real identity of Singapore as a nation. ISS has always been part of Chingay Parade. We are there to not only represent a country but the fact that the parade is open to all kinds of people. Foreigners, teenagers and elderlies. Although it was a hard time trying to catch up with the weekly practice and making sure that the costume is perfect at the end of the event we were pretty sure it was all worth doing.